Serena’s novels. Your next adventure. 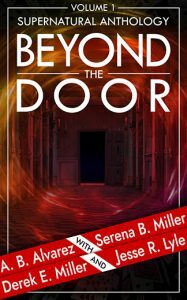 A mystified archaeologist, an Amish ghost, and avenging angels are just a few of the stories found in Beyond the Door, Volume 1, a twelve-story supernatural anthology. When multi-published authors get together for a play date, and are presented with a writing challenge they can’t resist, the results are not only surprising, they sometimes stretch the limits of their storytelling abilities. 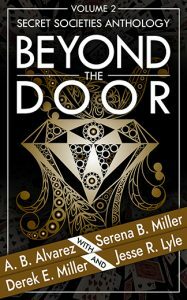 In the pages of Beyond the Door, the demons at play will not be what you expect. Where else can you find a robotic barista, a vengeful little girl, and a murderous goddess who wants to come out and play? What else may be lurking Beyond the Door? pregnancies mask a reality only they could survive to tell the world. you’ll find inside. They are halfway through the deck. 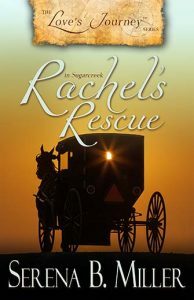 Policewoman Rachel Troyer has always looked after her three elderly Amish aunts, proprietors of a farmhouse inn near Sugarcreek, Ohio. The idyllic town is popular with tourists, who come to sample its famous Amish goods. But one thing is clear to Rachel – Joe Matthews is no tourist. When the bearded stranger lands on her aunts’ doorstep, begging shelter for himself and his young son, Rachel is suspicious. Will she be able to uncover Joe’s secrets despite her aunts’ – and her own – growing affection for him? A dying marriage. A heroic Amish midwife. A nameless baby girl. When Dr. Michael Reynolds gets an opportunity to take over a country veterinarian practice in Sugarcreek, Ohio, he jumps at it. His wife, Cassie, a Columbus attorney, is climbing the corporate ladder with lightning speed and refuses to go with him. Neither will compromise. 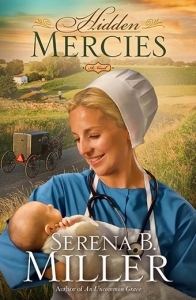 An Amish midwife heroically saves a newborn when its mother is killed on Christmas morning. Horrified at where the baby will be placed, she chooses to break the law and hide the infant among her people. Sugarcreek’s best, Officer Rachel Mattias, hunts for the baby’s family, but her investigation takes her to the inner-city streets of Cleveland where she has to fight through a dark maze of lies, suspicion, gang culture, and an overwhelmed children’s services agency. When two people’s dreams collide, who will win? Can an Amish midwife have the courage to stand up against serious threats? Will Rachel’s vow to uphold the law endanger an innocent? A lost legacy. A forgotten past. A derelict lighthouse. A daring mission. A battered helicopter. Will love overcome great fear? Snowstorms. Starving wolves. An Isolated Lighthouse. It is 1875 and Liam Robertson, keeper of the Tempest Bay Lighthouse, disappears during a series of record-breaking snowstorms on Manitoulin Island, Canada. 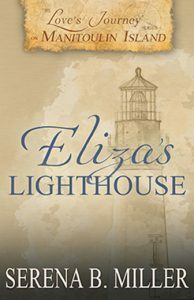 Miles from civilization, his wife, Eliza, and their fragile, ten-year-old son are virtually trapped inside the lighthouse. When the remnants of a dog sled team drags a half-dead stranger to her door. 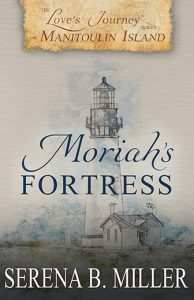 Eliza knows she must try to save the man’s life, but she soon fears that she and her son might be in danger as the man’s ramblings reveal that he spent years in prison. While parceling out their dwindling food supplies, and with no way to call for help, Eliza keeps the great light burning, clinging to the hope that it will guide her husband home. How different are Amish schools from our public ones? 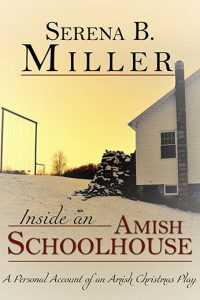 Author Serena B. Miller finds out when a friend invites her to a Christmas program in a one-room Amish school. 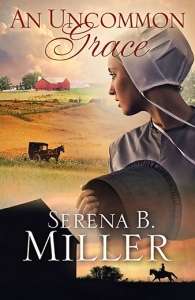 As Serena watches the Amish children recite and sing, she is reminded of the reasons Amish parents once willingly went to jail to protect their right to educate their children in the ways they thought best. No one fought the war on drugs with as much determination as county prosecutor, Blake Ramsey, until he died of a cocaine overdose. His wife, Erin, and teenage daughter have to live with the shame of his hypocrisy until Erin starts digging up information that others in their small town do not want revealed. Suddenly she and her daughter are in great danger and forced to run. Their only ally is the last person Erin ever expected to trust, a man her husband once convicted of murder. 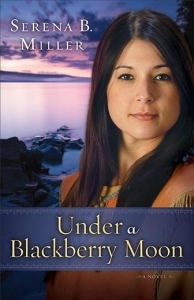 The Civil War in America is over and northerner, Katie Calloway runs for her life when she realizes her husband, an abusive Confederate officer, is planning to kill her. 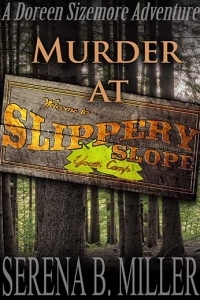 Katie and her little brother find refuge in a Michigan lumber camp where she hides her plight from the camp owner. Robert Foster wonders if the lovely young widow he’s hired has the grit to survive the never-ending work and harsh conditions of a remote pine forest in winter. What he doesn’t realize is that Katie’s greatest challenge will be guarding her secret, and her heart. 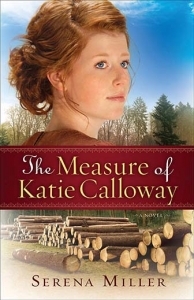 The Measure of Katie Calloway is the winner of the 2012 RITA award for Inspirational Romance! Can a marriage of convenience ever become one of true love? Ingrid Larsen arrives in Michigan in 1871 with little more than the clothes on her back and a determination. Destitute and barely hanging on to hope, the young Swedish immigrant crosses paths with Joshua Hunter, a newly widowed farmer with eyes the color of the ocean she had crossed and five rambunctious children to raise on his own. Marriage would solve both of their problems, and Ingrid finds herself proposing in broken English to a man she barely knows. Many difficulties lie ahead–but the hardest battle of all will be winning the heart of her new husband. 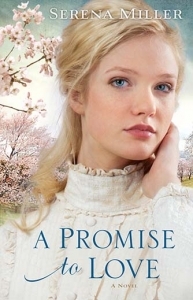 A Promise to Love won the 2013 Carol Award for Historical Romance! Grace Connor, a military nurse, moves from Afghanistan to rural Ohio. Neighbor, Levi Troyer, meets Grace after an intruder wounds his mother, and Grace saves her life. 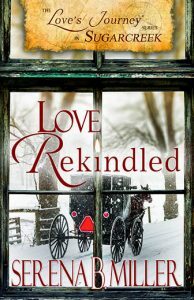 A deep attraction develops, even though Levi belongs to the Swartzentruber Amish–the most conservative and isolated of all Amish sects. Grace considers leaving her beloved farm and go back to war rather than continue to live beside the man she loves. Levi must confront the Bann if he pursues Grace. And a murderer must be caught. When lifelong allegiances are tested, can love and justice prevail? An Uncommon Grace is book #1 in the Uncommon Grace series. Claire Shetler is an Amish midwife struggling to support her young family after her husband’s death. Tom is former Amish who left Holmes County at age seventeen to join the Marines. Twenty-seven years later, Tom returns to Holmes County to recover from wounds sustained during an attack in Afghanistan. When he stops to make a purchase at Claire’s children’s little home-business—the last thing Claire expects is to fall in love with this battle-scarred soldier. Hidden Mercies is book #2 in the Uncommon Grace series. When Hope Yoder loses her husband, she is left trying to support her two small children—and one on the way—however she can. She ends up taking a job as a part-time housekeeper for the Englischman who has bought the farm that once belonged to her family. 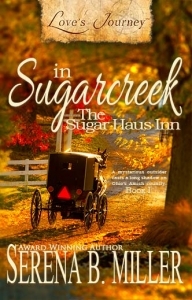 Logan Parker is a bestselling crime fiction writer from New York City who accompanies his fiancée on a trip to Holmes County, Ohio, but the trip takes a strange turn when he sees an Amish farmhouse for sale. Intrigued by a strong sense of familiarity, he enters the house and is overcome with a feeling of deep peace. He’s never been to Ohio before, but something in this house feels right, and he purchases the farm to use as a retreat. Something about the peacefulness of the house frees him from the crippling writer’s block that threatens to ruin his career, and something about the quiet Amish woman who comes to clean his home makes him less and less excited about returning to New York and the woman he is supposed to marry. Fearless Hope is book #3 in the Uncommon Grace series. In the tradition of Bringing Up Bebe and Battle Hymn of the Tiger Mother, an in-depth look at the practices and principles of Amish parents and how they raise children who are self-sufficient, hard-working, and remarkably happy. 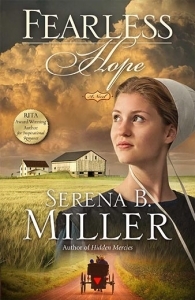 The more time Serena Miller spent in Holmes County, Ohio, doing research for her popular Amish novels, the more she began to notice something—Amish children were the happiest children she’d ever seen. Despite not having modern toys and conveniences, they are joyful, serene, calm, and respectful—not to mention whipping up full meals and driving buggies before most of us will allow our children to walk to school alone. And yet, when she started asking questions about what these parents were doing differently, she was startled to learn that happiness is not a goal Amish strive for at all. In More Than Happy Miller uncovers many surprising insights, including the significance of real responsibilities, the wisdom of unplugging from technology, the value of unstructured time to play, the importance of firm rules, and the importance of each teenager’s freedom to decide what is best for their future. 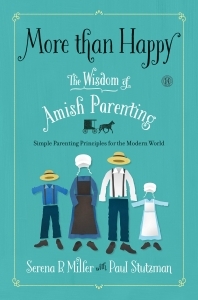 Full of practical takeaways, More Than Happy shows you how to apply the basic principles and parenting techniques the Amish use, so you can raise happy, well-adjusted kids. In this tongue-in-cheek short story, Doreen Sizemore, an elderly and opinionated Kentucky woman who hasn’t been outside of home town since her senior class trip, gathers her courage and boards the Texas Eagle train bound for her brother’s home in Texas. 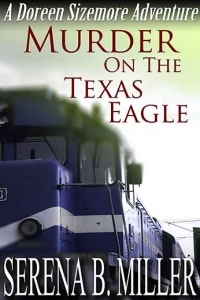 She is feeling quite the brave adventuress…until she discovers a murder on the train. In this tongue-in-cheek short story, Doreen Sizemore, an elderly and opinionated Kentucky woman who seldom leaves her small town, visits a niece who works as a Mary Kay consultant in Little Rock, Arkansas. 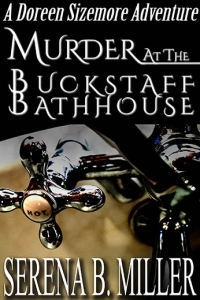 Her niece has a special surprise for her after she arrives—a nice, long, soak in the mineral waters of Hot Springs, Arkansas at the historic Buckstaff Bathhouse. Doreen is feeling quite the lady of leisure…until she discovers that a murder occurred while she was luxuriating in her first spa treatment. In this tongue-in-cheek novella, reluctant amateur sleuth, Doreen Sizemore, vows to never leave her home in South Shore, Kentucky ever again. 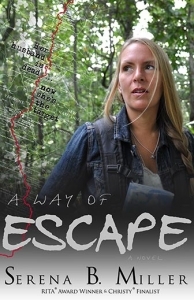 She’s afraid of discovering another dead body since murders only seem to happen when she travels. 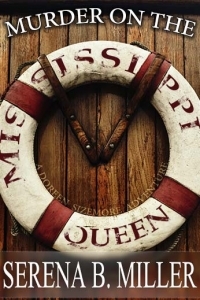 Her vow to stay home is broken when a newly rich relative offers her the dream of a lifetime—a trip up her beloved Ohio River on the Mississippi Queen. Doreen is thoroughly enjoying her trip until another murder lands her in jail! In this tongue-in-cheek novella, bad things happen every time Doreen Sizemore leaves her South Shore, Kentucky home. She can’t seem to go anywhere without stumbling over yet another dead body. So Doreen comes up with a solution. She won’t go anywhere. She’ll simply stay in her tiny hometown where everything is nice and safe. But is it? 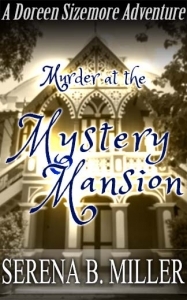 The more she gets involved with the family living in the Victorian mansion down the street, the more suspicious she becomes that there is something very strange going on there. 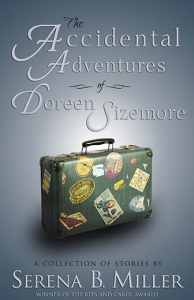 Doreen Sizemore is tougher than an old hickory stump and more opinionated than a pulpit-pounding preacher. The only thing Doreen hates worse than stumbling over another dead body is finding a rattlesnake sunning itself in her bean patch. Her hardscrabble life in South Shore, Kentucky makes her an unlikely sleuth, but every time Doreen leaves home she ends up embroiled in another murder mystery.